With two cores it's possible to separate the processing of different tasks in your application. This module is a powerful upgrade from the LPC1788/4088 – adding multicore functionality and better performance. The Cortex-M0 core can be used to off-load data movement and I/O handling that would normally drain the bandwidth of the Cortex-M4 core. For many applications this gives improved application performance. 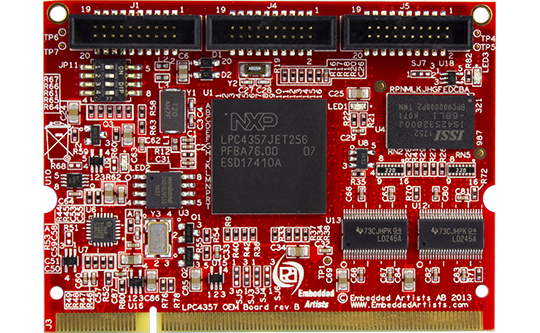 The LPC4357 microcontroller on the module is a part of NXP’s LPC4300 high-performance family with an ARM based Cortex-M4F @ 240 MHz core plus a Cortex-M0 @ 204 MHz core. The LPC4357 OEM board is available in industrial temperature range, -20 to +85 Celsius. The industrial (temperature range) version is suitable for always-on applications.